Hi everyone! 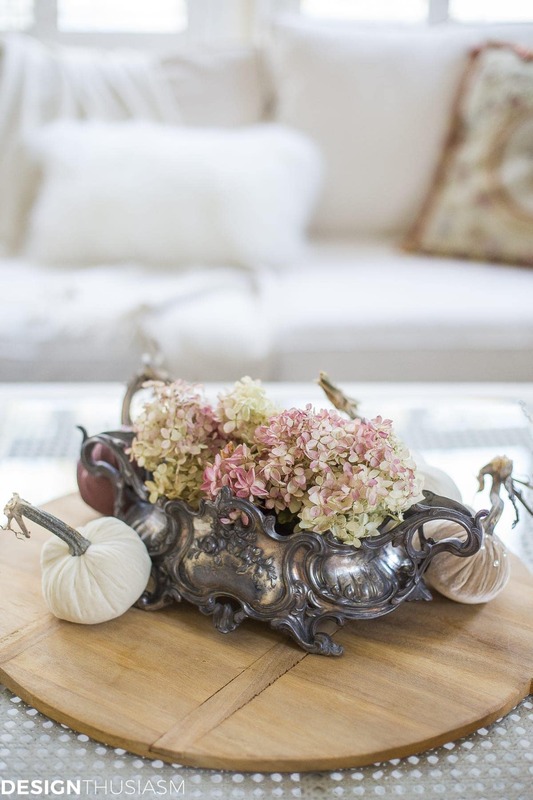 I’m so excited to be sharing my fall home tour with you today! 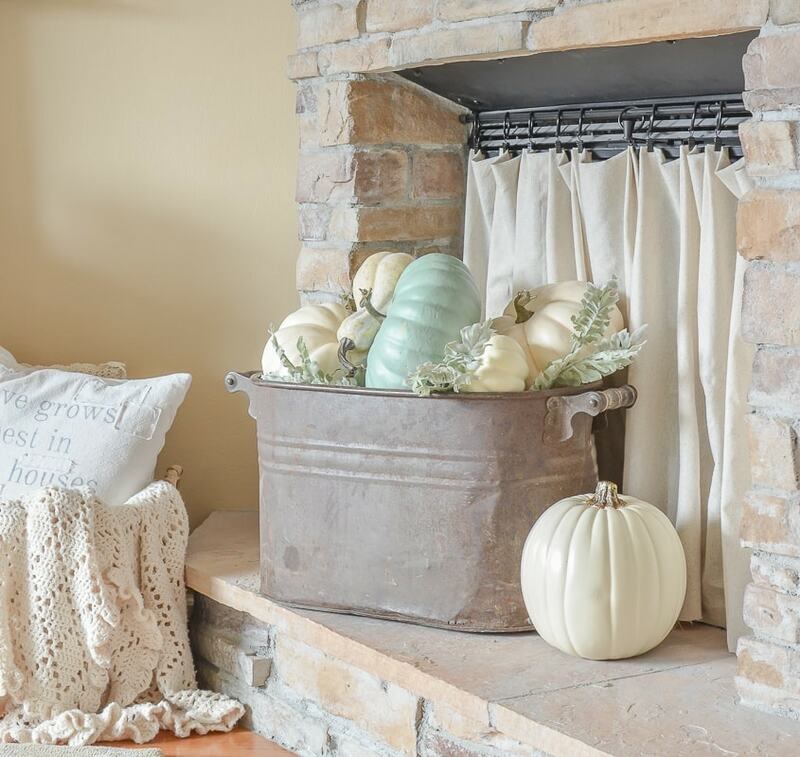 For this year’s Warm and Cozy Fall Home Tour, I’m joining 15 bloggers to bring you some wonderful fall decorating inspiration. If you are coming here from Edith & Evelyn Vintage, welcome! I’m so glad you’re here. 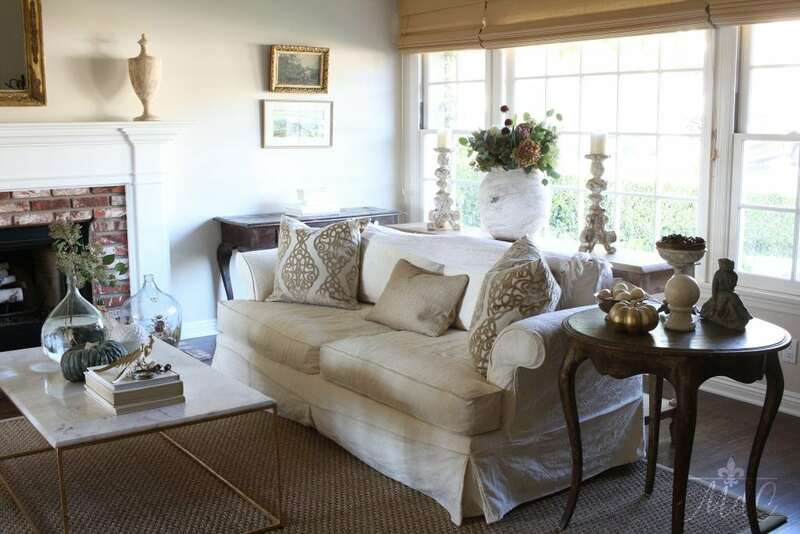 Cindy has such a beautiful home – I’m always in awe of her talent and her elegant French style. For last year’s fall home tour, I focused mostly on neutrals for my decor, which is what I did this year as well. But with a little twist. This year I really wanted to add some rich, fall color – but the bright oranges and deep rusts aren’t really my style. So I looked at nature and let that be my guide. The fruits and flowers of the season, with their warm and cozy colors of greens, muted burgundies, and dusty pinks is what inspired me. Think apples, pomegranates, and artichokes. And you know that faded color of a fall hydrangea? That is one of my favorite fall things and the exact colors I wanted to include! 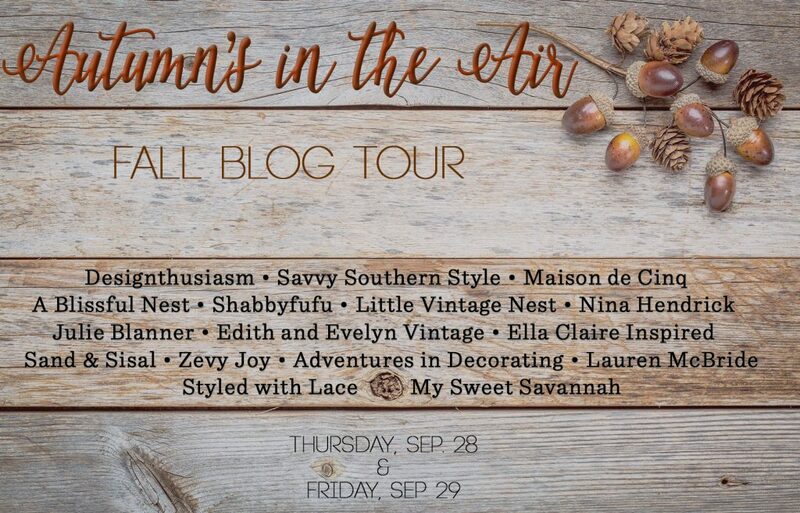 So welcome to this year’s edition of the Autumn’s in the Air Fall Home Tour, with a warm and cozy vibe…. 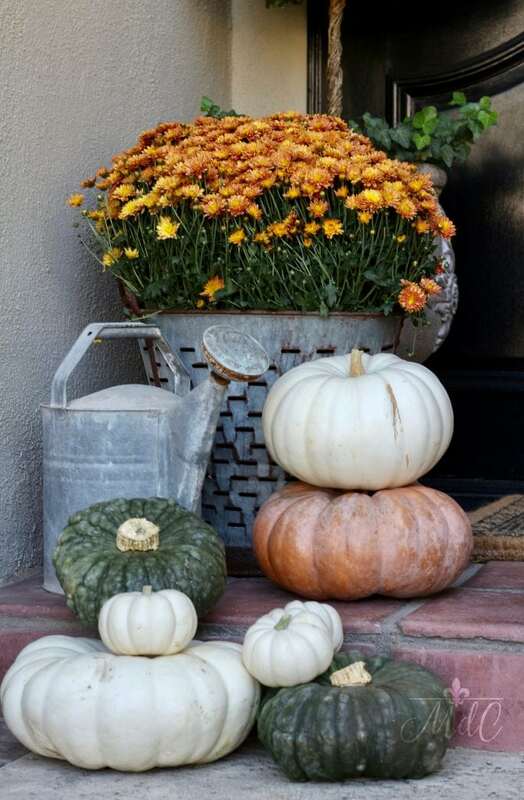 A mix of white and green pumpkins, as well as faded orange fairytale ones, are layered on the porch. I also put some little baby white pumpkins in a lantern. The wreaths on the door are new from Pottery Barn. I fell in love with their autumn-y colors! I loved the color of this mum with it’s faded look and I plopped it in a vintage olive basket that I had. My kitchen is decorated with mostly greens, florals, and fruits. I combined baby white pumpkins and apples from our tree, along with pomegranates on top of a cake stand. Another small white pumpkin is featured under a cloche. 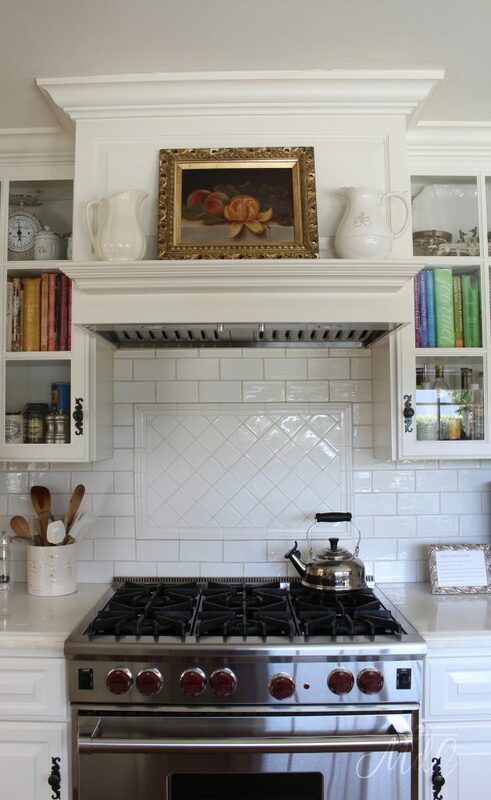 As some of you know, I adore cloches! 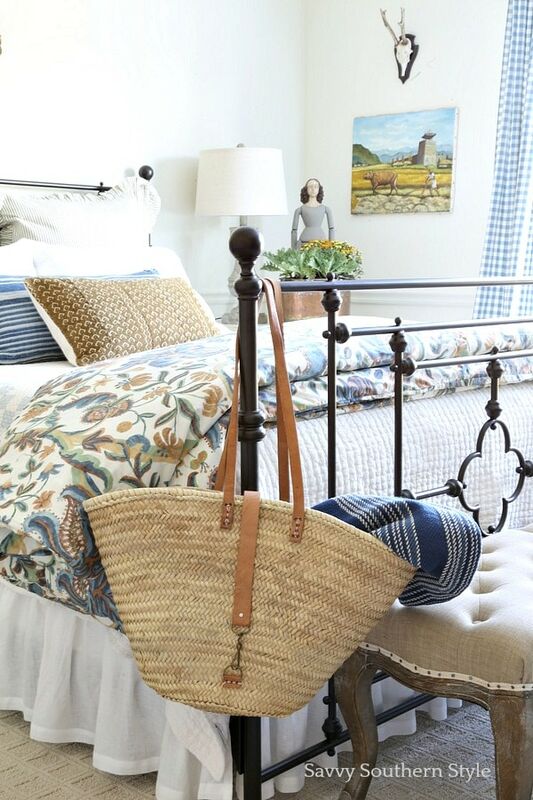 I just love the way they elevate anything – even the most mundane items – to something special! The greens are both seeded and silver dollar eucalyptus in a vintage French enamelware pitcher that I just got on my trip to France! I’m in love! 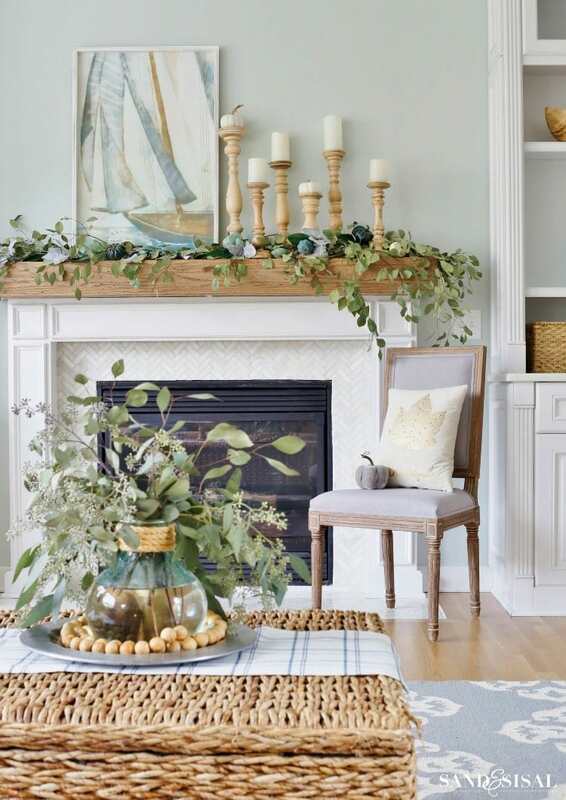 I love to change up the decor on top of my range mantel and this year, I moved an old oil painting into this spot. I love the fall colors and the warmth it brings to the room. 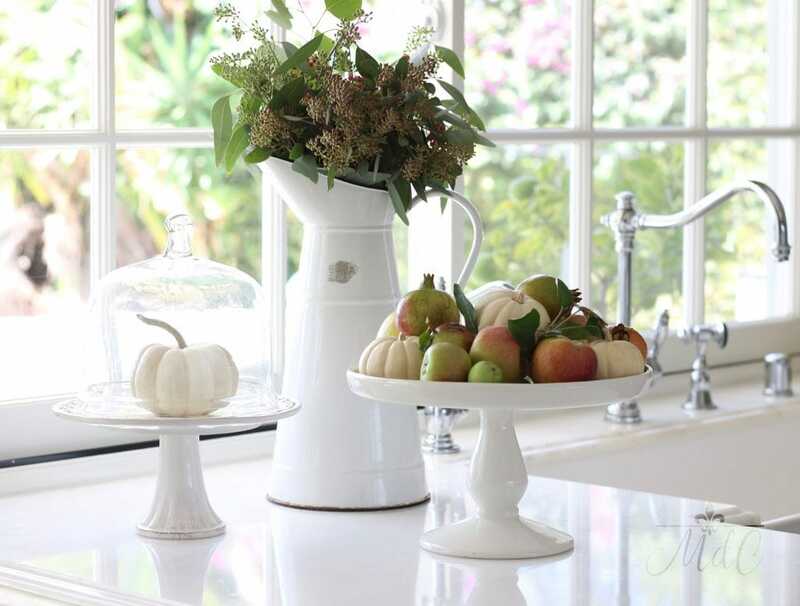 White ironstone pitchers, both new and reproduction, also hang out there. One thing I do love about fall is the warm colors. It’s such a nice change from all the cool blues and greens of spring and summer. I changed out the silver candlesticks that usually sit here for this brass pair. 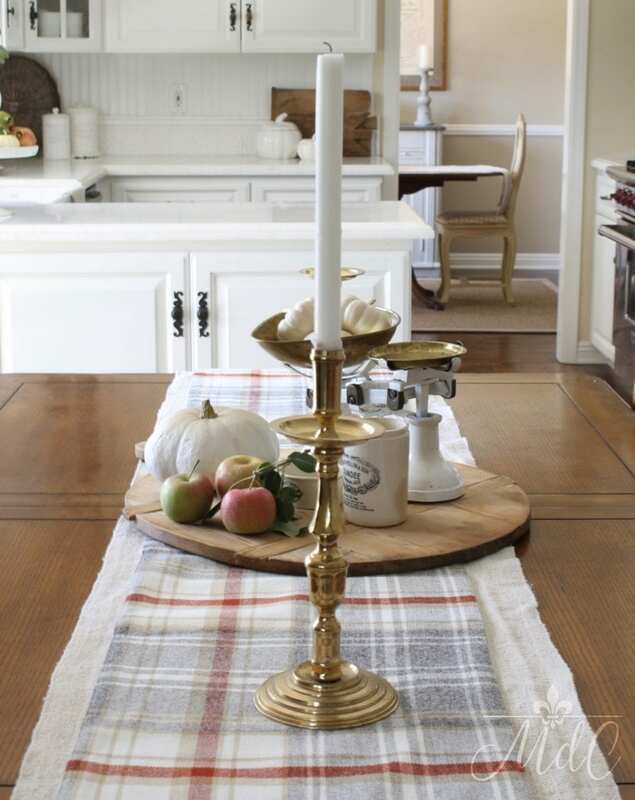 The plaid flannel runner is from Target. 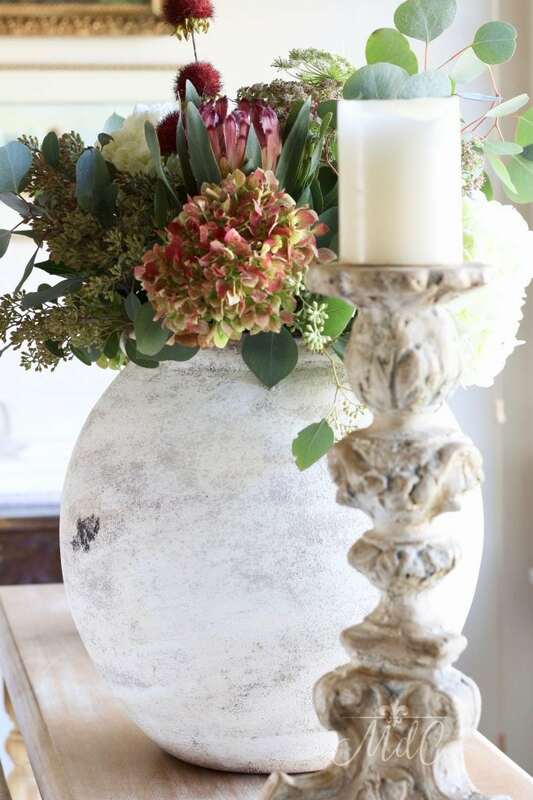 Love the greys mixed with the fall tones – so pretty! On the kitchen table, a vintage wood cutting board holds my old cast iron scale, and I already had the old mustard jars there as well. 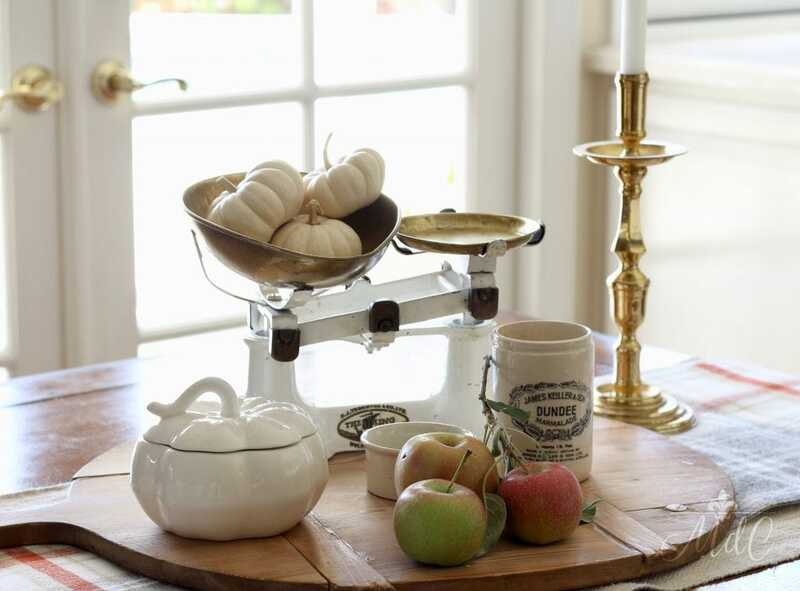 For the season, I simply added the baby boos in the scale and the cute little pumpkin tureen. 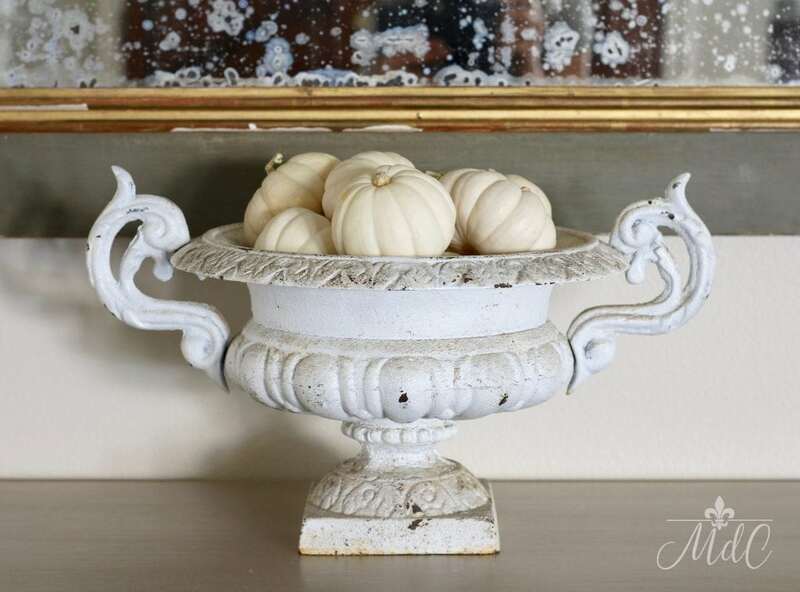 My favorite antique French urn filled with more white pumpkins in the entry way. 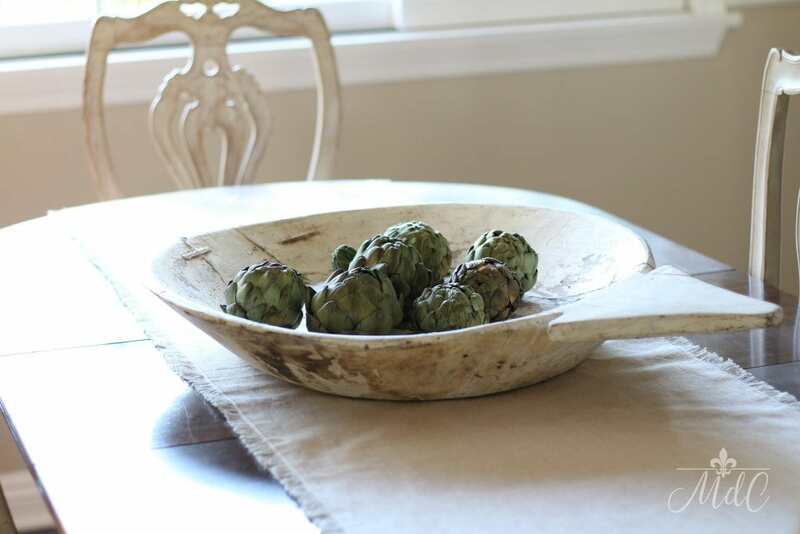 And in the dining room, an old white chippy vintage bowl filled with dried artichokes. 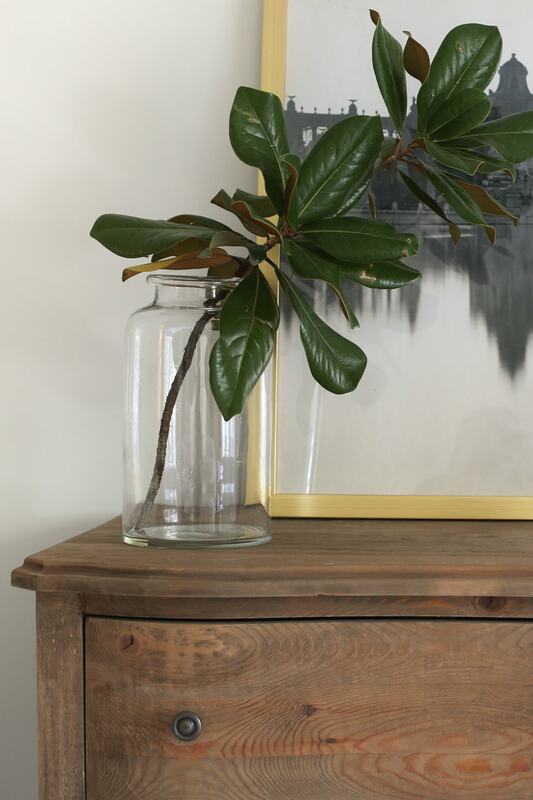 The coffee table holds a vintage demijohn with more eucalyptus, along with a green pumpkin and my favorite cute little acorn I got last year at Home Goods! 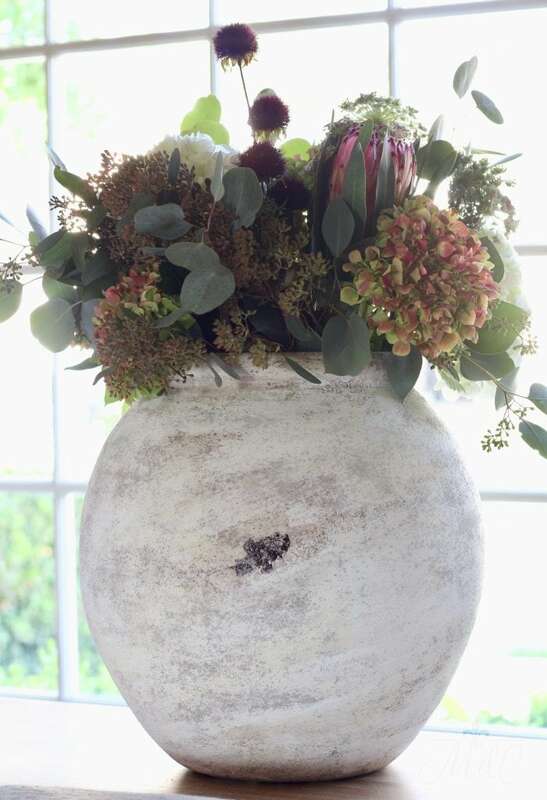 This Pottery Barn urn is filled with a mix of warm and cozy fall florals. 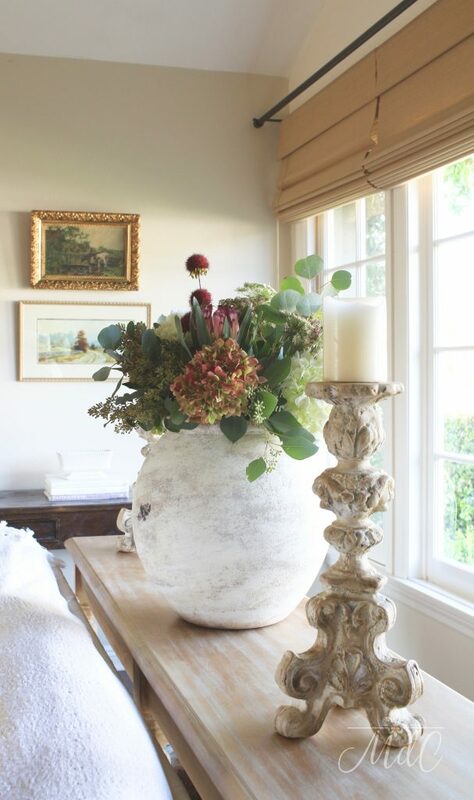 I mixed white hydrangeas (my fav! ), both eucalyptus’, and a few super market flowers as well as the hydrangeas from my yard that were changing color. 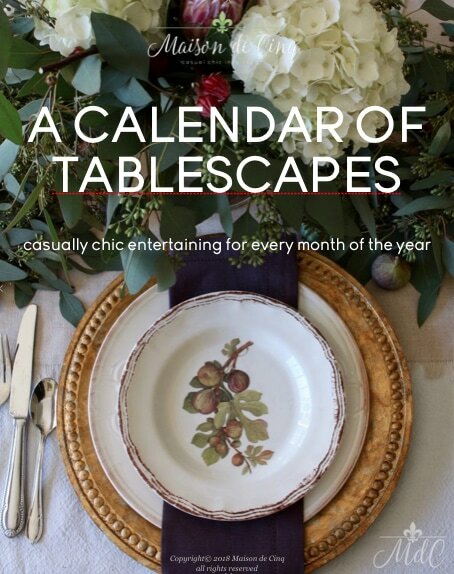 I absolutely love the muted colors and how it says “fall” without using the traditional oranges and reds! If you follow me over on Instagram, you know that the candleholder above is an old one that I recently chalk painted. It was kind of a blue grey and had never really worked in this room but now it’s so much better! Oh, the miracle of paint!! Thanks so much for stopping by! I hope you’ll go on to see my friend Janet at Shabbyfufu next and then onto the other bloggers from there. 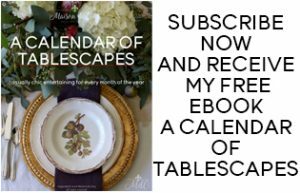 And I hope you’ll come by again tomorrow as the other eight bloggers will go live Friday morning! Also, if you want to see last year’s Autumn’s in the Air Fall Tour, you can find that here. Maison de Cinq’s Top Ten Posts of 2017! You have some TRULY terrific pieces!!! 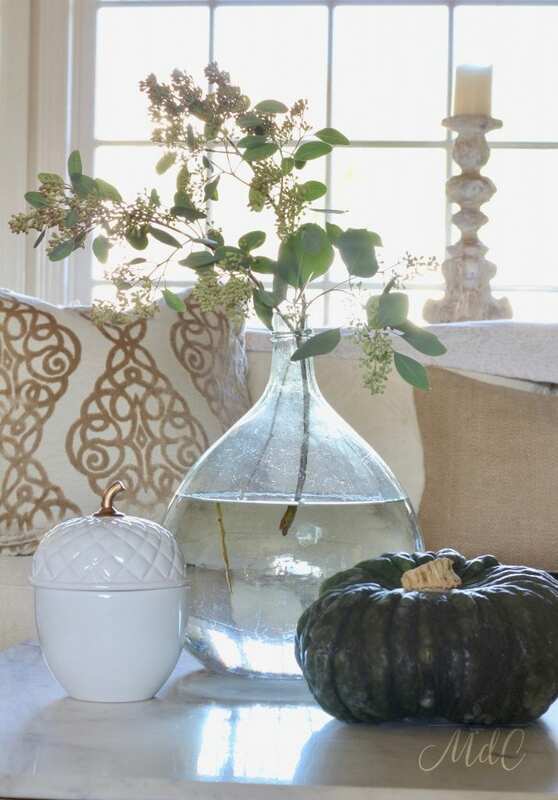 My favorite has got to be that awesome demijohn (filled with seeded eucalyptus) on that side table!!! Because it’s see-through! It doesn’t “heavy up” the room despite its size. Beautiful! Thanks for stopping by and leaving a comment – I so appreciate it! Your home tour is such a beautiful breath of fresh air! So simple and so beautiful. Thanks for sharing all your lovely photos with us! Awww thank you so much Julie – that is the sweetest compliment! I feel the exact same way about your simple and gorgeous spaces! So glad to be able to do this tour with you! 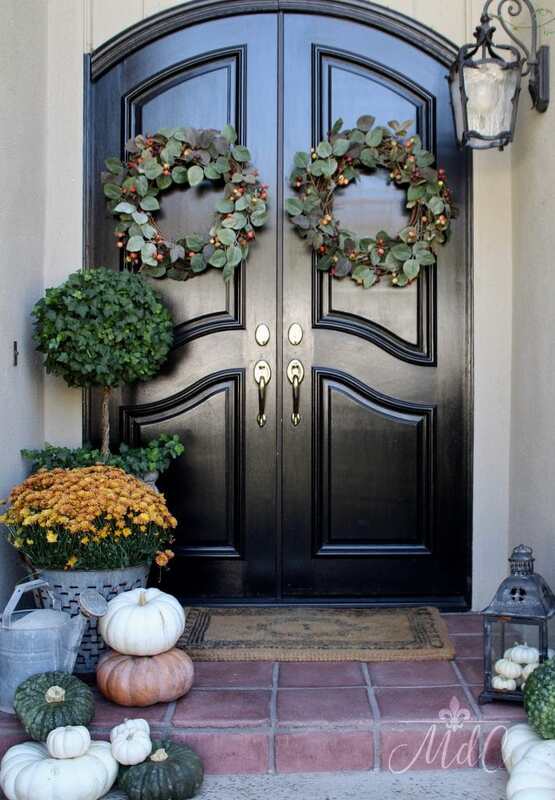 Sheila your home is gorgeous!i saw those PB rose hip wreaths online a mo th ago and they look so great on your front doors! I like the natural color palette you chose with the green hues. So glad I finally had some time to stop by! Oh, thank you so much Angelina! I’m so glad you stopped by too! Your home is so beautiful with the very special touches of Fall that you have created throughout. From the moment you walk up to your house you immediately get that warm and cozy feeling. Happy Fall! Thank you for stopping by the fall tour! 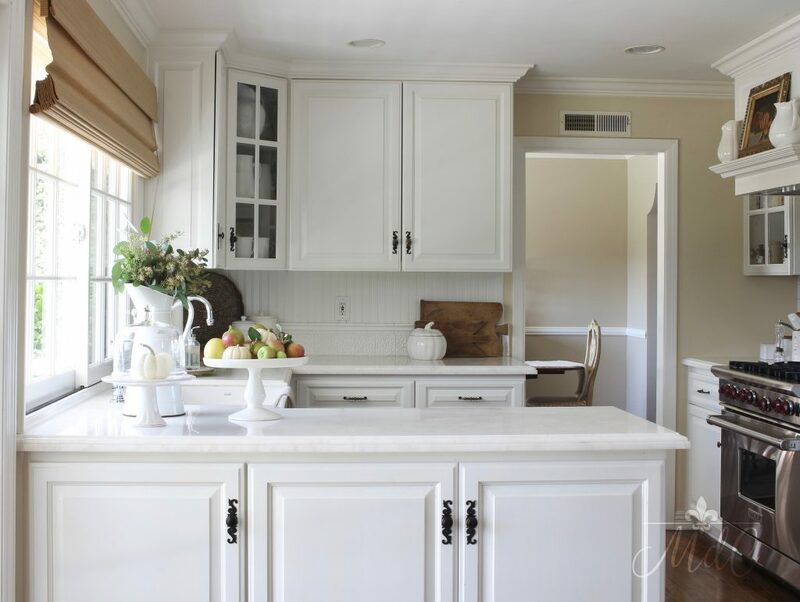 Beautiful Home Tour, lots of Pinning of your wonderful Kitchen! Oh gosh, thank you Debra! That is the sweetest thing to say!! Thanks so much for stopping by and for commenting – I so appreciate it! Sheila, your fall tour is gorgeous! 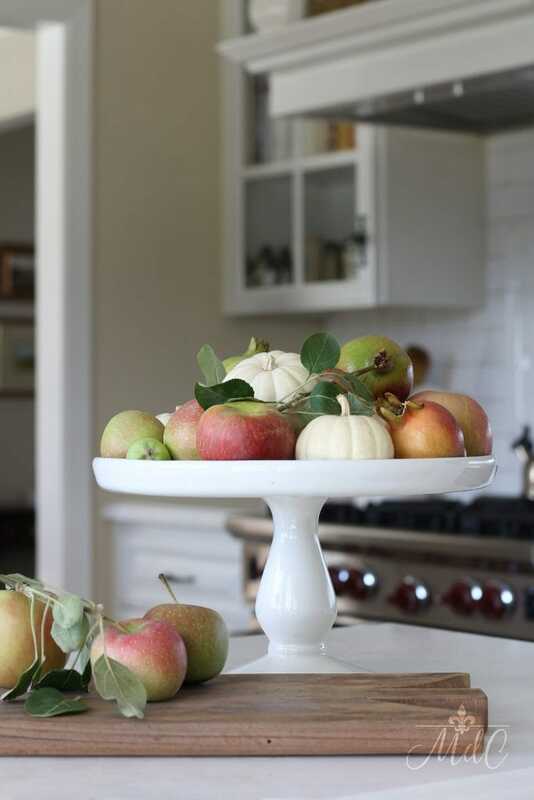 I especially love the apples mixed with pumpkins on the cake stand and of course all your beautiful urns and decorative pieces. You added just the right amount of color to complement your beautiful home. Enjoy your weekend! Thank you Shelley! I’m really into a muted kind of fall color this year, so I’m glad you liked it, too! Sheila your home is so warm and inviting and I love all your beautiful fall touches! I can’t wait to see what you do for the holidays! Thank you Rebekah! I appreciate your sweet compliment – and am so glad you could join us! Sheila, how incredibly stunning your home looks dressed for fall! 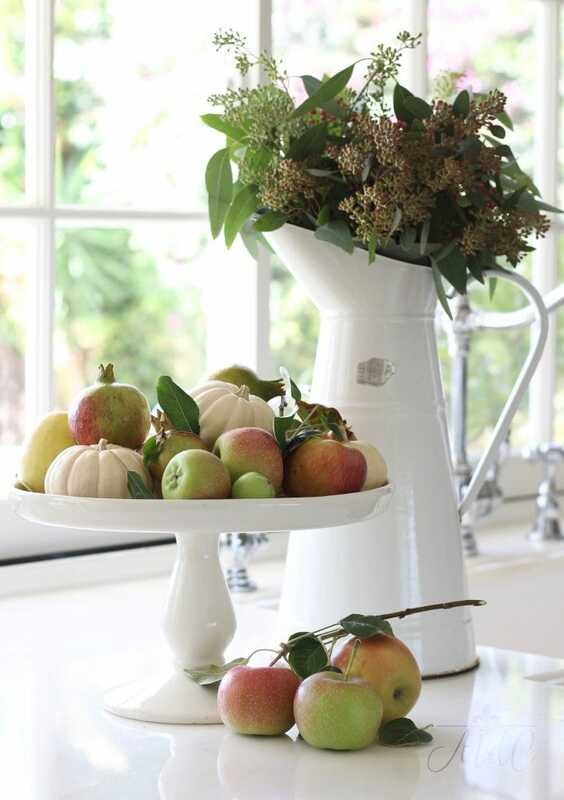 I LOVE the greens, flowers and fruits you’ve used to bring out the lovely subtle side of fall’s color palette. It’s funny you mentioned the bowls and receptacles in my post, because I feel exactly the same about yours! 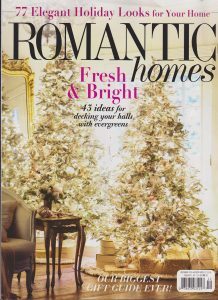 Each one is more gorgeous than the next and are what truly make your home so special. 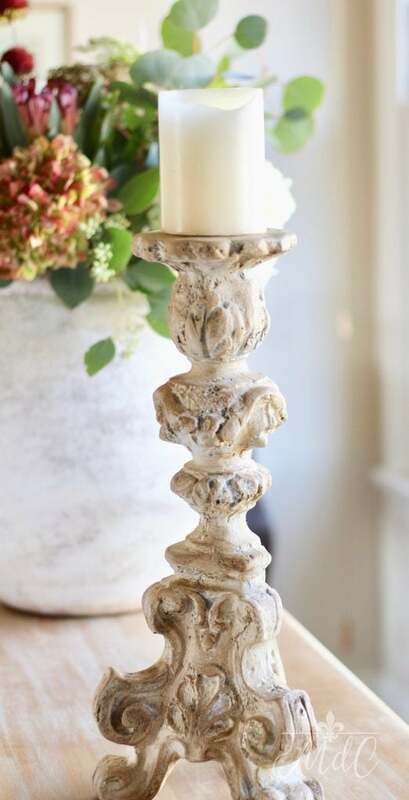 Those candlesticks are magnificent and that you painted them yourself makes me truly impressed! What a delight this post was! Aww thank you Lory! 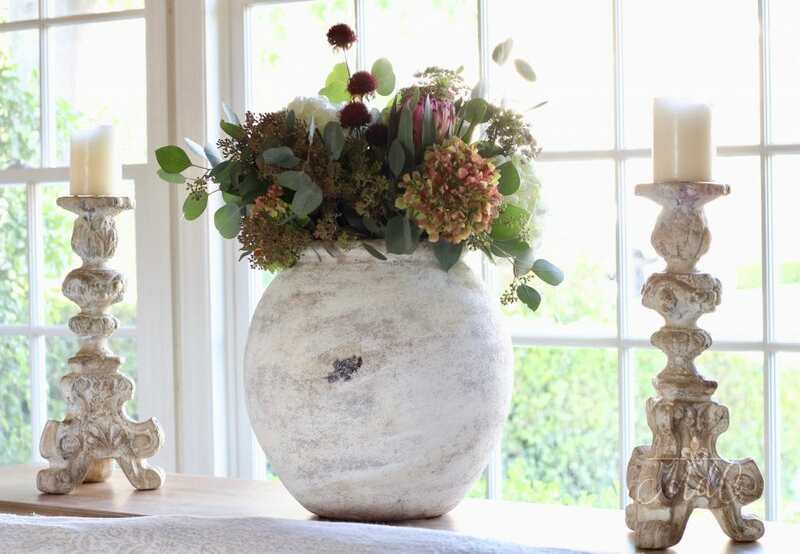 Not only do we love the same fall colors – now we can shop each other’s vessels and vases when we tire of our own, haha! Thank you again for joining and for all your help – always wonderful “hopping” with you! I just looooove your style. So peaceful, classic and interesting. Certainly not cookie cutter. Am so enjoying your blog. Beautiful Fall details!! We are planning a trip to France in the Spring. Can you share some favorite places from your recent adventure? Sheila what a beautiful tour!! 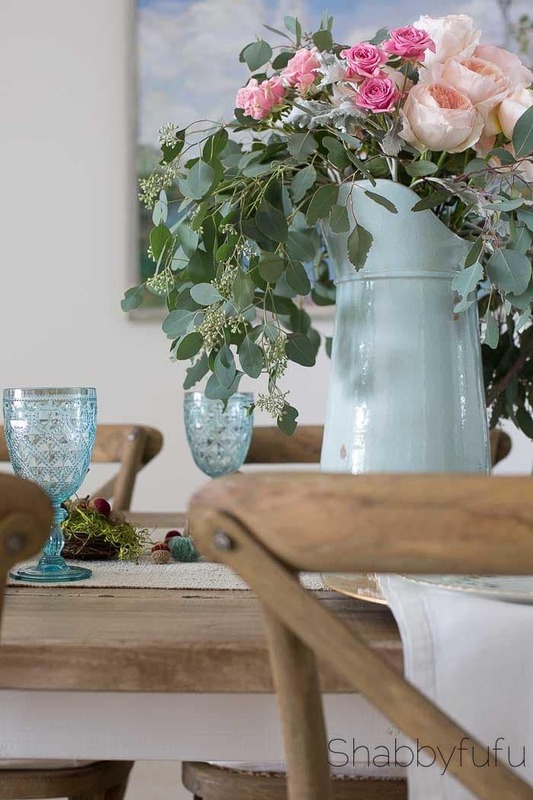 We just love your classic elegant style and love how you mix in French vintage finds!! Thank you so much for organizing and we are so happy to b teaming up with you again!! Thank you ladies! So happy to “hop” with you, as always! 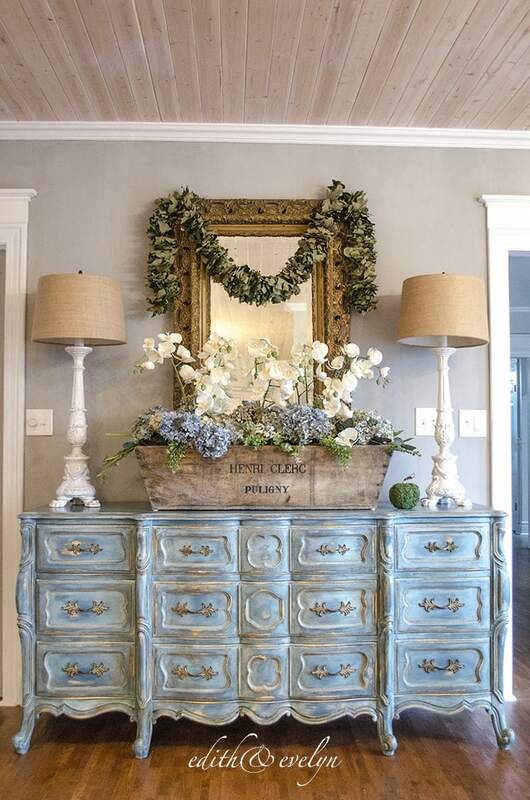 Sheila, I love how you add simple touches that changes the feel of a room. I love your classic simple sophisticated style. Thank you Alicia – I couldn’t agree more! Isn’t it fun how just a few changes completely change the feel of the space? And thank you for your sweet compliment – that means so much! Aww thanks so much Kendra! 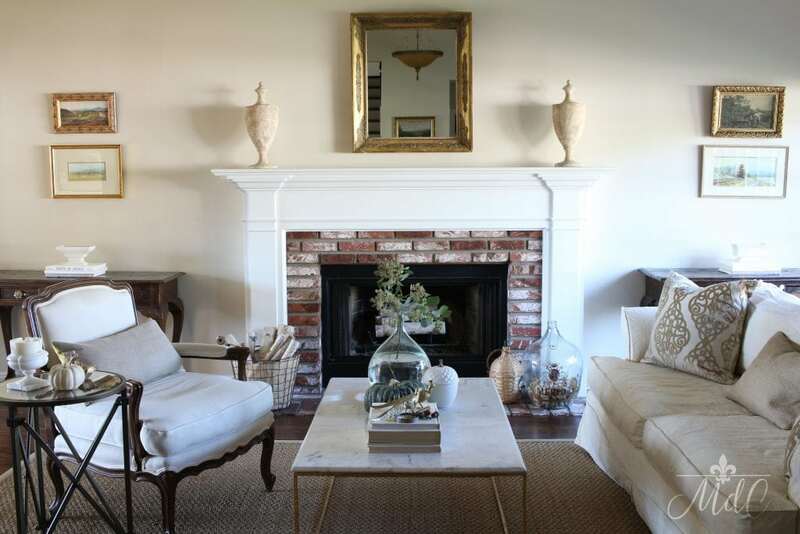 Hi – I would love to know the name of the white color wall paint in your living room. The room with the sofa and big candleholder. Thanks. Of course! It’s Muslin from Benjamin Moore and is very fair greige color. Hope that helps! Beautiful tour and home, Sheila. I love the light that comes in and you are so lucky to have your own apple tree. I had to drive an hour to go to an apple farm to find some natural apples that aren’t polished like the store ones and I was hoping to have some leaves attached. It was too hot to go pick them myself. I also love your candlesticks. I’m trying to get more French or Italian style ones and they are so expensive, even the reproductions. Thank you so much Kim! And I couldn’t agree more – apples with the leaves attached are so cute! And I love that the natural ones aren’t shiny, too. Thanks so much for joining and “touring” with us! And happy fall! 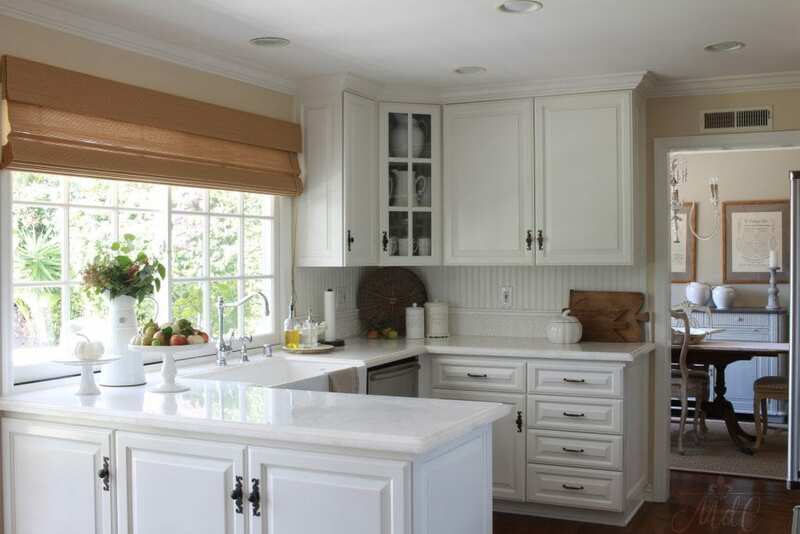 Sheila, your Fall home is stunning, elegant and inviting! Love the muted tones you chose, and, as always, your photography is fabulous … I look forward to seeing more! Happy to be joining you on this tour! Becca, thank you so much for your kind words! And thank you for joining us – can’t wait to see yours tomorrow!